It has been said that the Declaration of Independence was the promise; the Constitution was the fulfillment. Then you might say that the Bill of Rights was the affirmation. On December 15, 2016 those enduring first ten amendments to the Constitution turn 225 years old. GPO makes available a pocket copy of The Constitution of the United States and the Declaration of Independence that includes the celebrated Bill of Rights. Since they were ratified in 1791, that compact collection of amendments have become some of the most talked about text in history. Before their guarantees were plainly enumerated in the Constitution, there was a rumbling fear of the tyrannical actions of government. The concern grew loud enough to stall the Constitution’s ratification. In response, James Madison presented a list of amendments that would follow Article VII of the Constitution. His list placed prohibitions on government power and enshrined as inalienable rights the self-evident truths invoked in preceding documents. The amendments required approval from the House, Senate, and all state legislatures. Virginia was the last to ratify. 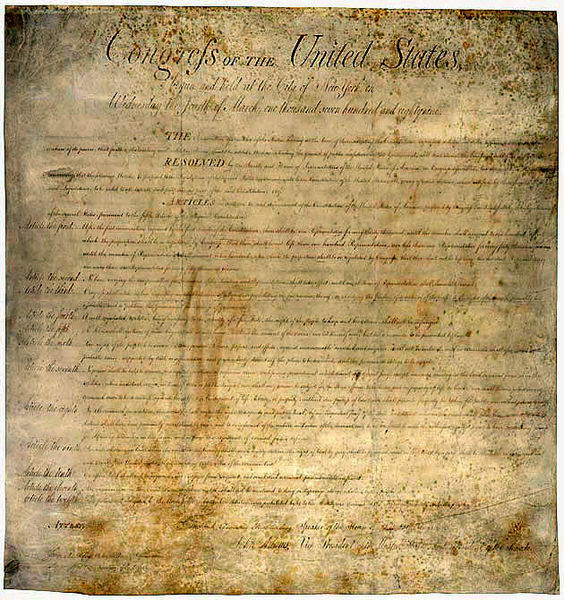 Finally, on December 15, 1791, the Bill of Rights became part of the Constitution. Without the Bill of Rights, the Constitution might never have been ratified. Although the phrase itself does not appear explicitly in the Constitution, the Bill of Rights is a foundational document that has lived long and large. Because of it, fundamental freedoms such as religion, speech, and due process of law are formally protected within the supreme law of the land. Together, the Bill of Rights and Constitution are the slow-burning coals of a quiet revolution, a steady progression to improve the quality of American life. They secure individual liberties and the spirit of popular sovereignty extolled in the phrase “we the people.” Bill of Rights Day is as good a time as any for “we the people” to re-read them. This entry was posted on Wednesday, December 14th, 2016 at 4:23 pm and is filed under U.S. Constitution, U.S. History. You can follow any responses to this entry through the RSS 2.0 feed. You can leave a response, or trackback from your own site.